Backed by Venezuela's military, President Nicolas Maduro went on the offensive against Juan Guaido, an Opposition leader who declared himself interim president, and his United States (US) supporters, setting up a potentially explosive struggle for power in the crisis-plagued South American nation. A defiant Maduro called home all Venezuelan diplomats from the United States and closed its embassy on Thursday, a day after ordering all US diplomats out of Venezuela by the weekend because President Donald Trump had supported Juan Guaido. The US, on the other hand, ordered non-emergency embassy staff to leave Venezuela but stopped short of complying with a full expulsion demanded by Maduro, who Washington says is no longer president. 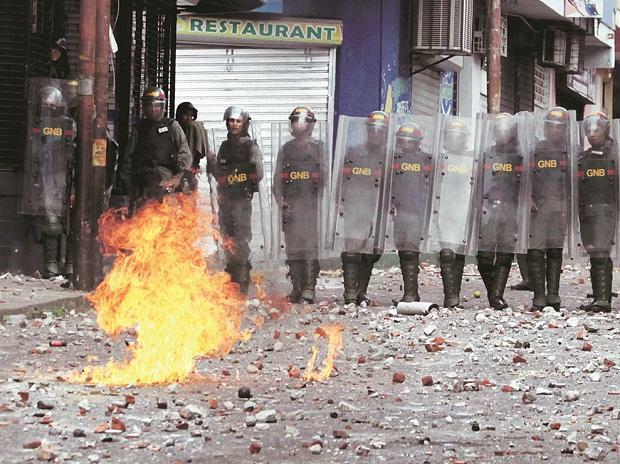 Amid mounting tension between Maduro’s forces and Guaido’s supporters, India said it was closely monitoring the situation in Venezuela and favoured resolution of the political crisis through constructive dialogue. "We are of the view that it is for the people of Venezuela to find political solution to resolve their differences through constructive dialogue and discussion without resorting to violence," Spokesperson in the Ministry of External Affairs Raveesh Kumar said. In fast-paced developments, Guaido, the head of the National Assembly, had declared himself as "acting president" of the country on Wednesday. Amid the development, oil steadied near $53 a barrel as traders assessed whether an escalating crisis in Venezuela will reduce already-depleted exports from the Opec member.